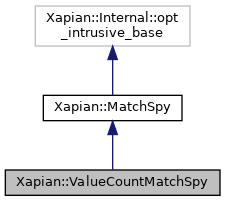 Construct a MatchSpy which counts the values in a particular slot. Class for counting the frequencies of values in the matching documents. Return the total number of documents tallied. This implementation tallies values for a matching document. doc The document to tally values for. wt The weight of the document (ignored by this class). Get an iterator over the most frequent values seen in the slot. Items will be returned in descending order of frequency. Values with the same frequency will be returned in ascending alphabetical order. During the iteration, the frequency of the current value can be obtained with the get_termfreq() method on the iterator. maxvalues The maximum number of values to return. Get an iterator over the values seen in the slot. Items will be returned in ascending alphabetical order.